Please check back often. This section is still under construction! Click on the dog's name to go to it's page and see pictures! Schimmel UPDATE August 23, 2009! PICTURES! Jasmin UPDATE August 23, 2009! PICTURES! Akasha UPDATE June 9, 2004! PICTURES! Others UPDATE June 9, 2004! PICTURES! I read somewhere once that to live with a wolfdog you have to have a sense of humor. That is putting it mildly. While these animals are gorgeous to look at, they are extremly intelligent and will come up with new ways to destroy your house and belongings just for the sport of it. Living with a wolfdog (or several) can be a trying experience -- but it can also be a very rewarding one. I can not stress enough that if you are considering getting a wolfdog, DO YOUR RESEARCH. Know what you are getting yourself into and be certain you are willing to endure and learn from the bad experiences (which there WILL be) as well as the good. ANY breed of dog will have it's positive and negative points. Be fair to yourself and any pet you are choosing by making sure you know what you are getting yourself into -- before it's too late to change your mind. 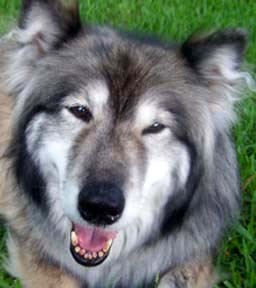 This section of my website will be devoted to my wolfdogs Jasmin (who has gone over the Rainbow Bridge) and Schimmel...as well as Schimmel's low content daughter, Kasha, who owns my "little sister" Angela. It will have lots of pictures and personal observations and links and resources when I am through. I may also devote pages to other things wolf/wolfdog related and other people's wolfdogs if people e-mail me stories and pictures.